Note:This product has been superseded by the Pathfinder Society Field Guide. At long last, the gates of the Grand Lodge have been thrown open, offering an inside glimpse of the Pathfinder Society! Packed with information about the most famous group of explorers on Golarion, this 64-page sourcebook is a must for any campaign that involves the Society, whether as employers or rivals. New feats and spells to help characters uncover ancient secrets—and protect their own! This book is fully legal for play in Pathfinder Society Organized Play, Paizo’s massive world-wide organized play campaign. To learn more about Pathfinder Society Organized Play, visit paizo.com/pathfindersociety! This product is out of print. This product is non-mint. Refunds are not available for non-mint products. Solid book, mostly focused on background information . . . I remember early on in the Pathfinder Society Organized Play circles, finding out what ioun stones did with wayfinders was a big deal. Strangely, that mystery seemed less important by the time this book came out, but the explanation was still a lot of fun. While there are some very useful spells, magic items, and gear in the book, this is mainly a book to explain the history and mindset of the Pathfinder Society. While it would be very nice if people interesting in playing Pathfinders would get a feel for the organization, if someone isn't the type of player to care about that, they aren't really going to get that much out of the book. Still, if you want to know how you may have been trained, how the organization started, what the lodges look like, and what the current clack within the Society might be, this is a good book to pick up. 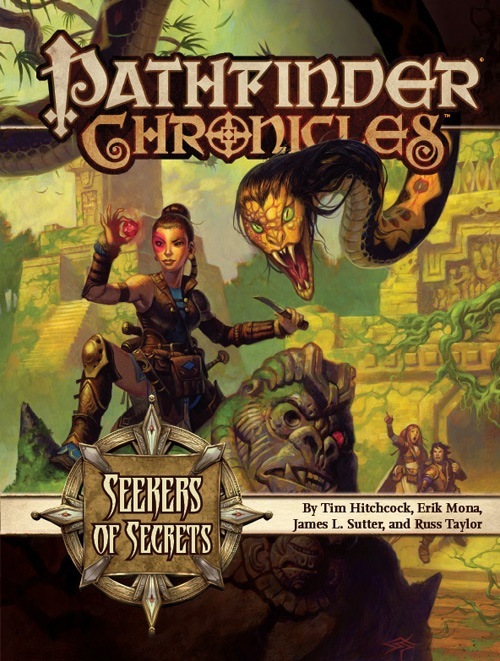 The book does seem to meander a bit when it comes to describing how Pathfinders view different regions of the setting, because there seems to be little difference between what Pathfinders see in a region and what general adventurers see in that same region. This book is a very interesting read. A lot of detail into the background of PFS. It is also a beautifully presented book. There is material in here that I will plug into the Magnimar leg of the RotRL campaign I am running. I have marked it down to a 4 star product. Basically is it really worth the $20 that is being asked for it? I think $15 is closer the mark. I get excited when I start reading but as I near the end of the book I feel empty... as their is not a lot of mechanics for new feats/spells as this item's summary leads you to believe. I would recommend this book to roleplayers who like details and background information for character development and to GM who want some details for PFS in their campaigns. This book is not for character optimisation. A GREAT sourcebook, cover to cover! I just finished reading Seekers of Secrets. What a great sourcebook. Very well written and interesting all the way thru. 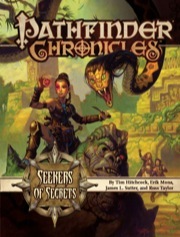 There are many plots, NPC's, and adventure hooks to be found in this volume of the Pathfinder Chronicles line. My only minor complaint is that in a few places, the authors used unnecessarily obscure words. I don't have the book handy right now or I would give you an example. It just seemed like a few "showing-off-my-huge-vocabulary" moments crept in a few times too many. That said, this is a fantastic Pathfinder RPG book. It details the Pathfinder Society, which is a big part of the Pathfinder Campaign Setting, and does it well. arrrrgggg!!!!! why isn't it june yet? Shiny! Excellent birthday present for me! I just love giving myself birthday presents. Is this another "by James Jacobs" placeholder, or is he actually writing it? I realize this may be too early but what about feats, prestige classes, magic items, etc.? Will we be seeing any of that? The unplumbed secrets of the Society’s vast Grand Lodge in the fabulous city of Absalom stand ready for your campaign, accompanied by a host of new magic items, feats, and spells appropriate for Pathfinder Society characters and fully legal for use in Paizo’s massive Pathfinder Society Organized Play campaign! You got your feats and magic items covered.. along with spells.. So all you need to know is whether there are any new prestige classes or not. That's what I get for speed-reading through the whole thing and missing some of it. This one looks very interesting. I have a soft spot for secret societies and such. The Pathfinder organization has this Indianna Jones adventure feel that I think works very well. Because those of us in Arizona want to enjoy 1 of our two seasons. Not Summer is just starting where highs will be in the 50s to 70s for the next 6 months. The other season called "A/C" has similar characteristics, but you can't go outside. Of course, I'm sure that whoever is the writer will be most excellent, I've yet to find fault with any of Paizo's various products. June is my B-Day month as well... it will be a very nice present to myself. On the other hand, we aren't ready for that yet, I'm still trying to close the 4e Forgotten Realms game with "Scepter Tower of Spellgard" hoping for a TPK so I can take 'em back to v.3.5 and Pathfinder (to stay) ;) Shhhh... don't tell them. Anyway... looking forward (eagerly so) to this book. Will the crunch in this one be PFRPG, 3.5, or close enough to be either one? It says that this can be used with the Pathfinder Society organized play and since by August that will be in the PFRPG format all the crunch in the book will be valid for more than two months. We're hoping to make the crunch in this book work for both 3.5 and for PFRPG, as much as possible. In fact, the majority of the crunch in books we're releasing now should be compatible with PF RPG; things like spells and feats and magic items are going to be relatively unchanged, after all; we're taking care that, in writing the new stuff, it's easy to use for either game. Actually, I'm not writing it (and there's an "s" at the end of Jacobs, FWIW). My name's used as a placeholder for products that we have to announce before the product has authors assigned, and it often takes us a bit to update the website. And yes, Erik's writing part of this book. So when do the Darklight Sisterhood get their own book? :D Come on you know they deserve it. We've probably said all we'll ever be saying about the Darklight Sisterhood, honestly. As a followup to my previous post... We try to create more than we can ever follow up on. In doing so, we're trying to leave significant portions of Golarion open for individual GMs to make their own. Hellknights, with the upcoming Cheliax AP, are going to get some extensive coverage during the Council of Theives Adventure Path, but Riftwardens don't yet have much on the schedule at all. But if we're discussing the detailing of Hellknights and Riftwardens, I'd like to chime in for Magesmiths! So who are the official authors on this one, Vic? Erik, Tim Hitchcock, James Sutter, and Russ Taylor, with some additional material by yours truly. ...or sometimes waiting until yoda8myhead sends an exploding cake. I hope your office closure tomorrow doesn't result in my most recent delivery going off with no one there to see it. We'll have the mailman forward any packages from you directly to Cosmo's house. It's almost June! Only 11 months to go! I want this book! Can't wait for September! Honestly I wanted it OGL, not PFRPG, but I get the impression the difference isn't that significant. I worked on a lot of rules-related material for the book, and most of what I turned over would work equivalently in either system. I'm really looking forward to this one I must say. :) September, next month, not terribly long to wait. I dearly love the Pathfinder Society. Aw :-( I was so sure we'd see a final cover for this one since Princes of Darkness and Sixfold Trial went live today. I guess that gives me something else to look forward to next week. Now is it out the door? It says it's expected next month, so I hope it is! And that we can see the cover! And that we can have the final back cover text! And for a million dollars? And for a million dollars? You need to say that in an Austin Power's accent. I hope, hope, hope that this product goes to the printer today. We're starting to think it's cursed. DAMN YOU EANDO KLINE AND YOUR MUMMY'S CURSE! SKR posted on Twitter that SoS is out the door (to the printers, I presume). Now it is off to the printers any chance to see the final cover?